Wool, trimmed with silk braid woven with metallic thread and mother of pearl and metal buttons. By the last decades of the 18th Century wool had taken over from silk as the fashionable fabric of choice for all but the most formal of men’s coats, and ostentatious ornamentation such as embroidery was limited to court suits and fancy waistcoats. 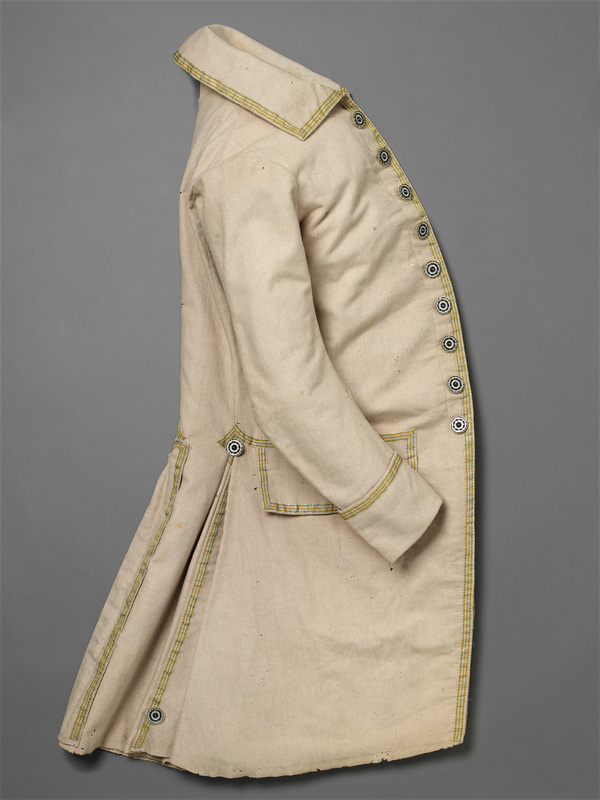 Nevertheless, as this wool coat demonstrates, decoration was still employed in a restrained form that reflected contemporary neo-classical taste. It is bordered with narrow braid (or lace as it was called) striped in bright acidic yellow and beige and woven with silver coloured fine metal strip and thread, outlining its curved front edges, narrow cuffs, pocket flaps, and turned down collar. The braid is mitred to reinforce the top of the skirt pleats in a manner seen on other coats at this period. The decorative focus of the garment is undoubtably the large mother of pearl buttons upon which designs of metal spangles and minutely coiled thread have been worked. Similarly ornate buttons, embroidered, enamelled, or set with pastes, were the last flourish on men’s coats before the simplicity of fine tailoring became their mark of elegance.